LRP is pumping! No, not Lead Replacement Petrol, it’s slide maestro Lee Roy Parnell, of course! Lee Roy is a great singer who plays wonderful slide guitar, too! Although he’s been a hired gun in his time, Parnell is highly respected as a performer in his own right, as well as being a bona fide Fender endorsee too (he’s a Strat man all the way as far as I can tell). Incidentally, I recall reading in one of Fender’s periodicals that Lee Roy can’t be bothered searching around for particular slides, he just uses whatever is readily available, although he does favour glass. I, too, prefer glass for its smoothness and fairly vocal quality. To begin playing slide solo, you’ll need to detune your thinnest E string down a tone to D – play a harmonic above the 5th fret of the 4th string and tune your first string to that. Remember, therefore, that the TAB will reflect the higher-than-expected note positions on the top string. Musically speaking, this altered tuning offers a minor 3rd interval between the 2nd and 1st string (they’re normally a 4th apart) and specifically this readily allows the 3rd and 5th (C# and E in the key of A for example), or the 5th and b7th scale steps (E and G) to be blended or played against each other; either way it’s a cool blues effect, and the latter can be heard at the entrance to slide solo. The main thing to check throughout this slide solo, and while playing slide guitar in general, is that you musn’t let unwanted notes bleed into any following notes (listen for good harmony where chord tone upon chord tone is usually acceptable). Accordingly, I’ve opted to show not only standard ‘CO’ (cut off) markings in the TAB, but several parenthesised COs as well. With this additional TAB information you’ll realise where you’ll need to effectively damp or deaden a note just before a fresh note appears (typically on a separate string but possibly on the same one) – this procedure isn’t as harshly enforced as when playing true staccato (meaning short and detached) although there is some of that too as can be found wherever a notehead has a dot above/below it in the notation. I’m not saying that there should only ever be one note sounding at any one time (besides harmony, handling noise and sustain in general can sound really cool if controlled well enough) but be careful to avoid undue messiness or cacophony. When playing bottleneck/slide guitar it’s usual to start phrases by sliding into a note or chord – it’s best to have a good solid target note such as the chord tones: Root, 3rd or 5th – although sliding away from the main note(s) is fine, too. You might like to spend a few moments browsing through the notation/TAB to discover any trend and balance or distribution as regards sliding direction. There are no rules as such but if you listen to a variety of good slide guitar players you’ll soon pick up on the idiosyncrasies. 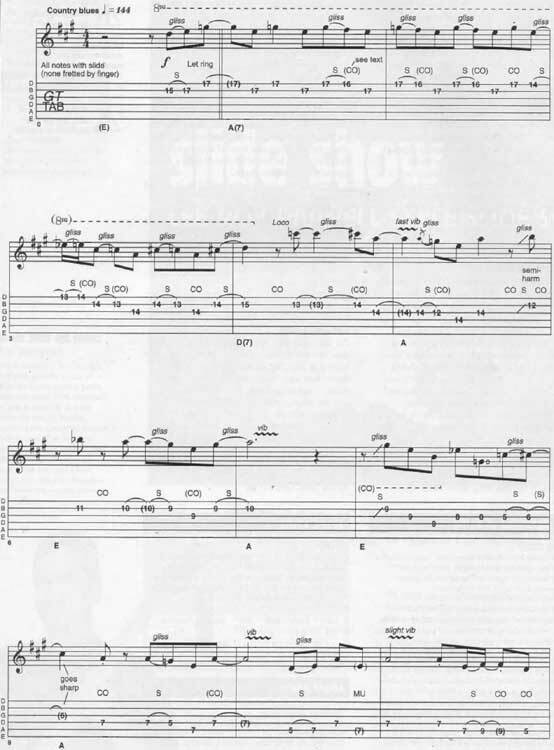 Licks that start by sliding from above are not that common though it can prove effective as found in the first few bars of my solo (the repetitive lick involves the b7 dropping to the 6th scale step for a somewhat melodic effect). Incidentally, one of my favourite slide downs, so to speak, is the following move which should typically be performed rapidly: root down to the b7 (as in bars 5 and 9). Technically similar is taking the major (or minor) 3rd down to the 2nd (usually followed by playing the root as in bars 18/19). Try both of these moves with and without [fretting hand] damping and see what you like the sound of. Landing bang on a note with the slide and staying put is less common – it’s expected that you’ll typically add vibrato sooner or later – but that’s just what I do at the end of bar 15 – notice the slightly bothersome rattle! Consider that if you’re not applying any form of slide technique then you might be better off just fretting a note normally with a spare finger. Cutting off notes abruptly, especially as part of a musical phrase, fan be particularly effective as at the end of bar 20. Notice, too, how the altered tuning easily gives a bold lick with a twist (the F# and A could be part of a D chord so there’s interesting ambiguity there considering the accompaniment is A at that time). The ‘trill’ in bar 21 is not a proper classical type of move, rather it’s just me waggling the slide around somewhat frantically! It sounds like a trill of sorts, though. The staccato notes were strategically introduced next in order to regain control – if, like me, you happen to panic occasionally, be careful not to freeze! Just stay calm – feel the pulse from the drums – and immediately play something bold and meaningful. Alternatively, strike a pose and poop yourself! Finally, notice how my slide solo ends rather like it began but with a definite resolution to the high root note (A). Try to make your soloing have direction and with some landmarks along the way. Try to make a point. But, as I always say, don’t try too hard. Gertcha! I use a Dunlop 275 med-heavy ‘Blues Bottle’ (heavy wall) with a closed end, which can get a bit sweaty during heavy use, I’ll admit! However, it’s toneful and manageable for speedier manoeuvers, so it’s worth a bit of discomfort. I might also use type 272 from time to time, which is lighter and slightly thinner-sounding. I like Pete Tindall’s ‘genuine bottleneck’ (the green wine-bottle type), as well. Brass slides, especially the heavier sort, may offer a bit more sustain and body, tonally speaking, but they generally sound slightly scratchier, which may or may not bother you depending on the kind of music you’re playing. Whatever you choose, I’d recommend something reasonably weighty because lightweight materials sound awfully weedy to my ears and tend to bounce off the strings a bit too easily for my liking. Check out Lee Roy’s Every Night’s A Saturday Night album and guest appearance with Jed Zeppelin (!) playing on ‘Working Man Blues’. Also look for his name on albums by American country music artists including Trisha Yearwood. It’s a part of Lee Roy Parnell Style Slide Solo guitar lesson. © 2012 - 2019 TabsClub Powered by TabsClub 42 queries in 0.257 seconds.